Training for triathlons makes me anxious. Just like being a parent. Each leg of the triathlon offers unique challenges. Just like my kids. 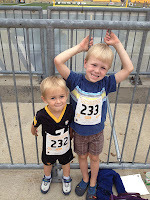 And while it's true that having kids can make it hard to find the time to get in my triathlon training, I try to focus on the positive and the ways that having kids helps me train smarter and harder. Open water swimming definitely triggers anxiety thanks to too many viewings of the movie Jaws, Jaws 2, Anaconda, and that shark movie with LL Cool J. Even swimming in the pool is different. It now includes counting strokes, fixing my arm cross-over, doing drills like whale-eye and Popeye-mouth and swimming for a long, long time. I can get a little worked up when swimming gets tough. 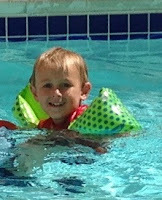 So, I think of my three year old and how he loves to swim. Thoughts of him help me laugh and relax when I'm swimming because he loves wearing goggles around the house and jumps into the pool without fear. Even really cold pools. He's crazy! I love it. Cycling this summer means clipless pedals and shoes, handlebars with drops, faster speeds, bigger hills and longer rides. It means learning to clean my chain, check my tire pressure before rides, how to change a tire, how to eat on the ride, how to drink on the ride and relax. Honestly, that is really hard for me on a bike. So I think about my oldest son, now eight years old. He recently learned to ride without training wheels. Talk about a leap of faith! Once he learned we got him a bike with five gears. The open road calls to him and he laughs out loud cruising down our neighborhood hills. I tried that today and it really helps. Running is my best leg. But that doesn't mean I can't get better. So I'm working on tweaking certain aspects of my form. I'm still monitoring arm crossover, working on forefoot landing and increasing turnover. I'm also learning how to use a HR monitor during my runs. Another new thing! And when I'm on the track doing intervals on a hot Sunday afternoon when everyone else is drinking margaritas and eating BBQ I think of my middle son. He does things different. He was the only one of my three boys brave enough to run a kid's race last summer - so his bravery inspires me on my runs. There is so much I still don't know - but I am willing to learn and give it a try. And I talk about this with my kids. They loved hearing how each one gives me a different kind of boost during training. My first triathlon of the season is this weekend. It's the Butler Y Triathlon north of Pittsburgh. I'm looking forward to my opening day. 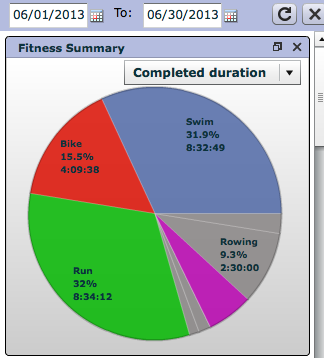 I've been working pretty hard, logging 20 hours of training in June, double what I did in May. Even though I will race this sprint triathlon it isn't the BIG race that I'm training for - the big one is my first Olympic tri in August all the way across the state in Doylestown. While I believe I have the fitness level to complete the event, it's the mental toughness and the unique challenges of each event that will really test me. But I will focus on my successes from this summer (including my longest open water swim and longest bike ride). I will also focus on thoughts of my family.